Three thousand hits: one of the most touted milestones in all of professional baseball. You can hit five hundred home runs and have a terrible batting average. You can win over two hundred games, but have a less than stellar ERA. But one thing that you cannot do in Major League Baseball is reach three thousand hits without being a great hitter. If you were a career .300 hitter, it would take you ten thousand at bats, not counting walks and sacrifice hits, to get to three thousand hits. It would take close to two decades to even get the chance to get ten thousand at bats in the Modern Era. And to get three thousand hits is one of the few pure records in the game that is not tainted by the Steroid Era. This brings us to arguably one of the best players in the Modern Era. Right up there with Ken Griffey, Jr. and Barry Bonds, Derek Jeter of the New York Yankees is one of the top stars of the last two decades. And after getting two hits on Sunday in a 9-1 victory at the expense of the Cleveland Indians, Jeter is now just seven hits from reaching the epic milestone of three thousand hits. Lucky for Jeter, the next four games will be right at home in New York. And even better, Jeter is on a hot streak. 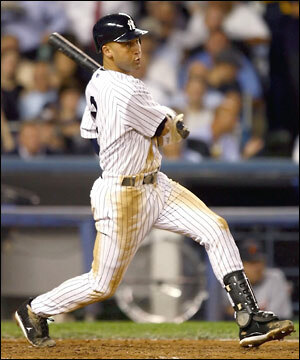 In the last eight games, Jeter has batted .500, going 12 for 24 and getting multiple hits in five of those eight games. Jeter is currently batting .276 this season. The Yankee Captain is clearly fighting off the nemesis of all professional athletes: age. Since 1999, only Tony Gwynn, Jr., Wade Boggs, Cal Ripken, Jr., Rickey Henderson, Rafael Palmeiro, and Craig Biggio have gotten to three thousand hits. All signs point to Jeter being over-pressured as players in the past have been when they near milestones. Lucky for Jeter, he is not the only MLB player nearing a milestone as Jim Thome is closing in on becoming only the eighth man to hit six hundred career home runs, so he can share the limelight a little bit. But the watch is on. It is not a matter of if, but when. All eyes are on the Yankee Captain, Derek Jeter, as he approaches one of the most prized milestones in all of American sports.